Visqueen Horticultural Sheeting - The One Stop Plastics Shop Ltd.
Notes: The S in the product name stands for seasons. All prices quoted are for 10 linear metres. Please call us for bulk purchases or specific lengths. The purpose of this note is to clarify the facts about greenhouse films and their effects on growing environments. It also describes the key features of the Visqueen range of greenhouse films. We see light over a short range of the sun?s radiation - within the narrow wavelength band of 400 to 700nm. Plants respond to a slightly wider range of light, including parts of the ultraviolet range (290 to 400nm) and in the far red (up to 800nm - just outside our visible range). The term Photo synthetically Active Radiation (PAR) is used to describe the range of light which is responsible for plant growth. However most of plant growth is driven by what we recognize as visible light. Plants respond most to light in the blue (400 to 450nm) and especially the red (625 to 675nm). But other wavelengths are able to trigger photosynthesis, and the sun?s peak intensity is in the yellow region (525nm). Therefore interrupting any colour of the spectrum will reduce plant growth. The graph ?Light wavelength and plant growth? shows the average relative response of plants to different wavelengths. The variation in the intensity of sunlight is also shown; combining these gives the estimate of plant growth as it varies with wavelength. Blue light : plants respond to the intensity of blue light, and reducing the blue light will encourage plant elongation and leggy growth. This response is not relative to the strength of radiation in any other part of the spectrum - it is the absolute intensity of the blue light which influences plant height and quality. Red light and Far Red light : there is a more important response which depends on the relative intensities of red (660nm) and far red (around730nm) light. Increasing the amount of far red light relative to the red makes plants grow tall and spindly. Increasing the red relative to the far red does the reverse. If the red/far red ratio is increased significantly, significant height reductions and changes in plant habit can be achieved. This is the principle behind ?Solatrol? growth control film. These plant responses are believed to be part of the shade avoidance mechanism of plants. Plant responses are not linear with the red/far red ratio; for example, a small reduction in the amount of red light can bring about a significant amount of stem elongation, whereas a large reduction in the far red may be needed to achieve the reverse effect. However it should be noted that plants can vary in their response to red and far red light. Any coloured film will reduce the light transmission and therefore plant growth rate. This will be the case whatever the film colour, as all parts of the visible range can contribute to plant growth. By removing parts of the visible light selectively, coloured films can alter plant growth, not always beneficially. For example, green films proposed for shading remove red light selectively. This removes the most efficient waveband for plant growth, and also changes the red/far red ratio. This triggers the plant shade avoidance mechanism, and plants grow leggy as well as slowly. Blue films also remove a large part of the red light, but minor changes to the absorption of blue light allows us to see the film as blue rather than green. It is likely that the human eye is more able to appreciate this change than a plant is. However, some blue films also absorb in the far red, and therefore avoid a significant change in the red/far red ratio. The result will be reduced growth rates, but without much change in plant habit. It is unlikely that these films will provide a significant benefit in plant height control. White tinted films reduce transmission across the whole PAR region uniformly. Growth rates will be slowed but natural light balance will be maintained. Although this is not significant for photosynthesis, it is now understood that the UV may be a factor in the development of colours, flavours and fragrances of some plants. Short wavelength UV (290 to 310nm) may also be a factor in preventing plant elongation. These wavelengths are usually removed by the UV stabiliser systems of greenhouse films (and also by glass). Some fungal infections (especially botrytis) can be influenced by the UV, as the production of spores can be triggered by the UV. Removing the UV can slow down botrytis infections. It has been shown that to be effective, removal of the UV up to 400nm is required. Insects see partly in the ultraviolet. Removing UV can slow down the spread of insects (beneficial and harmful). This has proved to be helpful in some Mediterranean areas where crops are at great risk from insect infestations, and where it is difficult to keep them out of a greenhouse without closing up the structure to an unacceptable degree. Since insects are often virus carriers, reducing insects in this way can also reduce viral infections. Greenhouse films have traditionally used an absorber of short wavelength UV as part of the stabiliser package. Replacing or augmenting this with alternative absorbers can broaden the band of UV absorption up to wavelengths of 370 to 380nm, and this is the principle used in some greenhouse film for insect and/or fungal control. However, these additives are not permanent in the film, and are lost over a period of time through diffusion and degradation. Therefore a film may not show the broad band UV absorption throughout the course of it use, and is likely to be less effective in this respect well before the film?s physical life is ended. 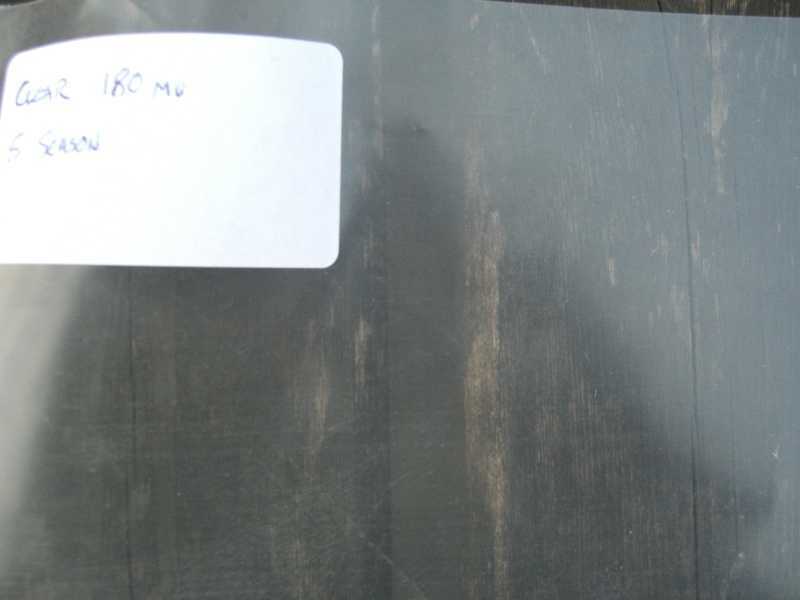 In most circumstances, a clear, colourless greenhouse cladding material (like glass!) will transmit the maximum amount of solar radiation. However, if the film is made cloudy in a controlled way so that the overall amount of light transmitted is not reduced significantly, there can be advantages in the amount of light made available to plants. This is because the diffused light reaches the plants from different directions and is spread more evenly around the plant canopy. The degree of diffusion of a film is usually measured as a ?Haze? figure. This is the percentage of the light being transmitted which is deflected outside a small angle around the direction of the incoming light beam. For effective diffused light, this value should be as high as possible. We would only class a film as highly diffusing if the value is above 85%, and ideally it should be above 90% for maximum effect - always assuming that this does not reduce the total amount transmitted by more than a very few percent. Films with degrees of diffusion of 60 to 70% are best described as semi-diffusing. Clear films which have become soiled and weathered can have haze values which approach those of semidiffusing films. Accurate measurements of light levels inside a greenhouse are difficult to do and can lead to mistaken conclusions, particularly if the film covering is diffusing or semi-diffusing. Using conventional lux meters or PAR detectors will usually give an underestimate of the level of light in these circumstances. This is because these instruments are ?cosine corrected? and give a lower reading if a light ray is at an angle away from the vertical relative to the detector. With a diffusing cover film most of the incoming light is scattered away from the direct beam, will meet the detector at a range of angles and will give a lower reading than that measured with a clear film ? but the light level as far as plants are concerned will be the same, or even higher. The standard accepted method of measuring the light transmission of a greenhouse film is to use a film sample placed in direct contact with an integrating sphere detector. This measures the amount of light transmitted regardless of any scattering or change of direction as the light passes through the film. Laboratory instruments can measure light transmission of film sample as a function of wavelength. In a spectrophotometer the wavelength of light is varied and the intensity of the transmitted radiation is measured. A spectroradiometer uses a constant light source with a broad band of wavelengths or natural sunlight; the detector scans across the wavelength range and measures the intensity at each wavelength. Results from each instrument is often similar, but a spectroradiometer can detect any shift in wavelength caused by the film (such as by fluorescence). In each case, the results may depend upon the detector used. An integrating sphere will measure the total transmission regardless of scattering angle whereas a cosine corrected instrument will give a value related to the direct component any scattered radiation. If there are differences in scattering angle with varying wavelengths, the cosine corrected detector will reveal this. The presence of discrete water droplets on the surface can reflect light away from the greenhouse. It has been shown that water droplets can reduce light availability by up to 15%. ?Anti-fog? films contain additives which encourage water to condense not as droplets but as a thin layer. For this to work properly, the film must be installed so that the water can flow without interruption down to the edge of the film. It is important to realise that anti-fog films (also called ?anti-condensation? or anti-drip?) films do not eliminate condensation in a greenhouse, but can contribute to the management of condensation. Water will always condense on the film surface if there is moisture in the greenhouse atmosphere and the outside temperature is cold enough. Condensation will be increased if the relative humidity is high, which can be influenced by the plants which transfer water vapour from the soil to the air through their leaves. Ventilation or heating may be necessary to remove moisture from the greenhouse - an anti-fog film will not do this; it will only change the way condensation moves or accumulates on the greenhouse cover. Occasionally, a mist can form in a greenhouse with an anti-fog cover. This occurs early in the morning if the inside of the greenhouse is humid and the outside temperature is increasing. This is believed to be caused in an ?anti-fog? greenhouse because the film actually carries less water when the condensation is as a thin layer rather than as droplets, so the amount of water in the air is higher. Also, when the film warms up there is a large area of water which evaporates into greenhouse, forming a mist when it reaches the colder air inside the tunnel. Ventilating the greenhouse removes the mist, and also raises the temperature by bringing in warmer air from outside. 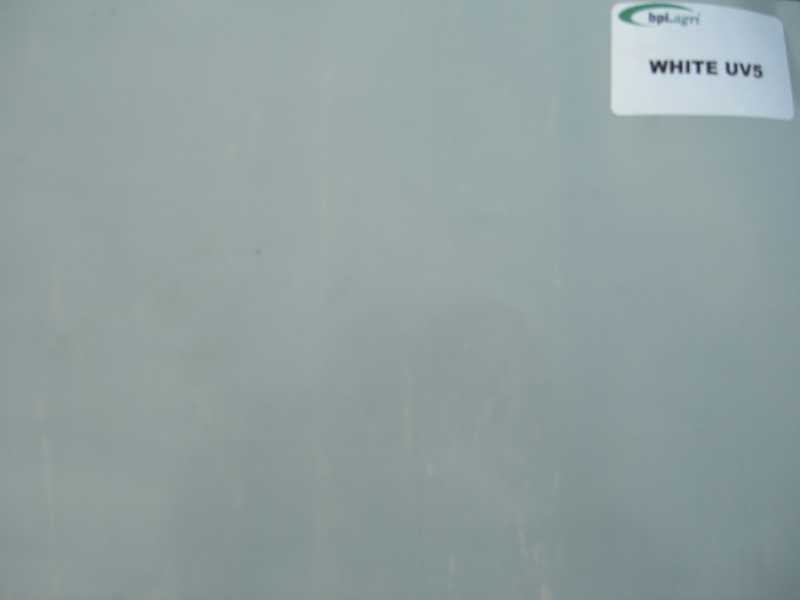 Anti-fog films are usually made from grades of polyethylene which retain heat quite well in a greenhouse. There will also be a temperature lift because of the increased light transmitted, and because the water layer on the film surface also adds to the heat retaining properties. 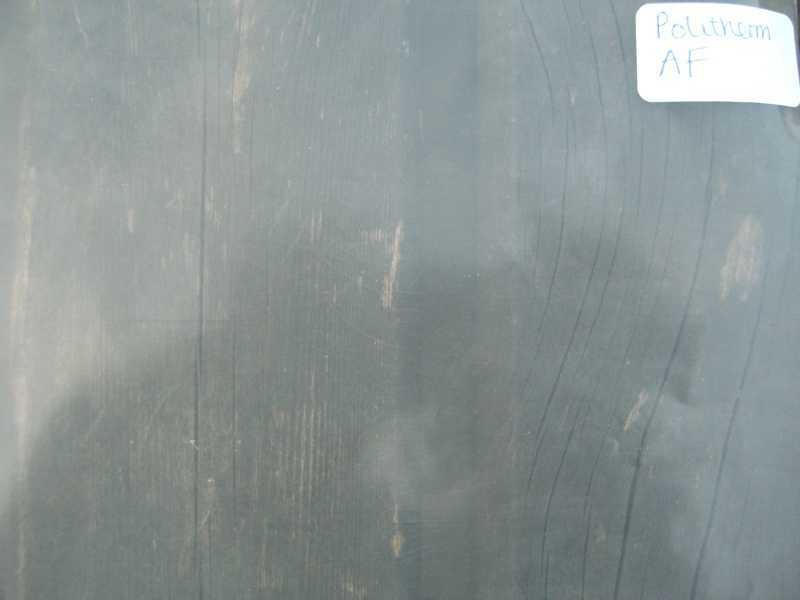 Conduction through the film to the outside air (because cladding films are very thin, there is not much opportunity to influence this by greenhouse or film design). Double skin greenhouse systems may reduce these losses, but usually there is cold external air between the film layers which will reduce the insulating effect. Exchange of air with the outside - either by accident or on purpose. Ventilation is obviously an important feature of greenhouse design and operation. Radiation of long wavelength infrared energy from the system through the greenhouse film. The composition of the film influence this significantly, and can make a major contribution to keeping greenhouse warm at night and in the winter. Heat retention is achieved by choosing the correct polymers for the film or by using special additives. The thickness of the film will also have an effect - thinner films will tend to give colder night-time and winter temperatures. The greenhouse film can contribute to heat control by both influencing the short wavelength radiation coming into the system, and by retaining the long wavelength radiation losses from the structure. White tinted films reduce incoming light across a wide range of wavelengths, and do not usually contain heat retaining additives, so are the first choice for a cool structure. Coloured films remove light in the visible which cuts down heat input. 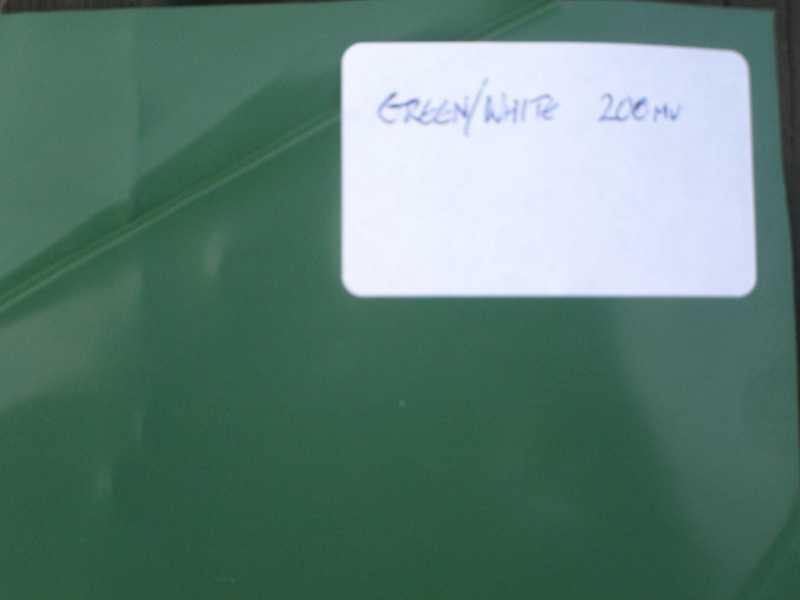 In white and coloured films the growth rates of plants will be reduced because of the reduction of visible light. Luminance THB shows differential scattering across the incoming solar radiation band, scattering short wavelength infrared at greater angles than the visible light. This can reduce the effect of incoming heat radiation and so can maintain a more even temperature while keeping PAR levels and plant growth high. Diffusing films based on foamed polymers have been proposed as heat control films. However these films can reduce PAR transmission as well as showing some differential scattering. Because about half of the sun?s energy is in the visible/PAR region, reducing transmission in this area can lead to effective heat reduction, but plant growth will be much reduced as well. Temperatures in greenhouses can be measured for the air, soil or plants themselves, and there are a number of factors which influence these. Air temperature will be influenced directly by ventilation, and plant temperatures may be controlled by the plant growth process itself. Soil temperature may be affected by the intensity of incoming radiation for the first few centimeters of the soil, but will be constant at lower levels. Plant scorching may be influenced more by radiation intensity than by the air temperature. Visqueen has pioneered most of the applications of polyethylene films since the company introduced the film process into Europe. 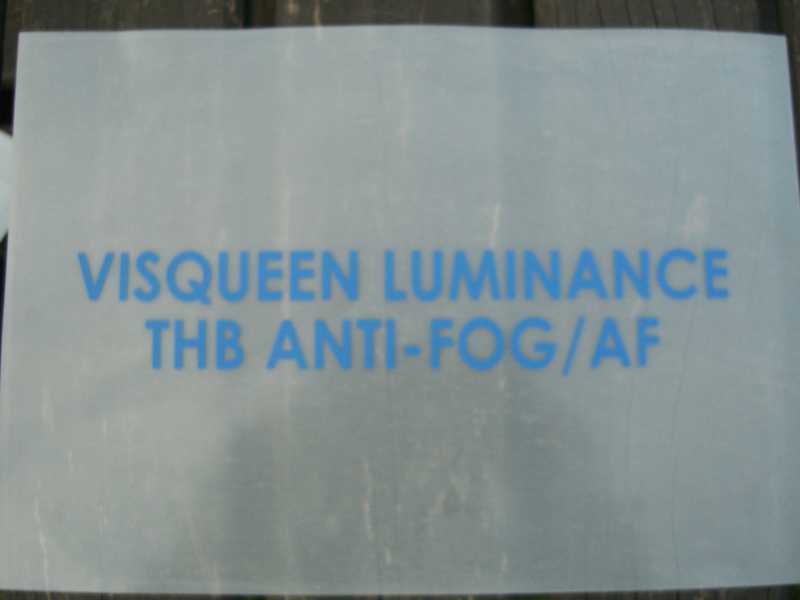 In the development of greenhouse films, Visqueen has introduced anti-fog thermic films (?Politherm AF? and ?Luminal?) and highly diffusing heat barrier films (Luminance THB) - both of which have attracted imitations. In recent developments, Visqueen has looked systematically at botrytis control, and at growth control films (?Solatrol?). It our policy to ensure that new film development is conducted in association with the best scientific sources, and is subject to rigorous evaluation. Our product information is provided in good faith and is based on observations at growers and independent organisations. We plan to work to foster relationships with centres of technical excellence and with growers to continue our programme of film development. A clear film which is resilient and easy to install. A economical choice for applications where there is little to be saved on heat inputs and where condensation is not a problem. Formulated to improve heat retention. Temperatures will be higher and savings can be made on overnight heating. 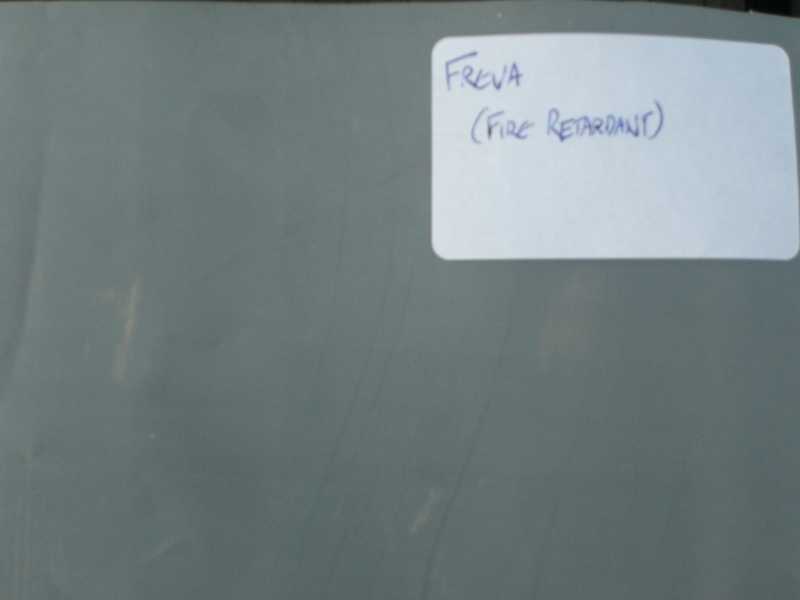 Have thermic properties and additives to control the condensation of water on the film. If properly installed, water will condense uniformly on the film rather than as droplets. This improves light transmission and reduces the risk of water falling on plants. Best for crops which respond well to high direct light levels and warm temperatures. Combines high diffusion, high light transmission and excellent thermic properties. Designed to make more light available to plants by increasing the amount of diffused light to close to the maximum, and to reduce the proportion of short wavelength infrared light. Can achieve good growth rates with reduced risk of scorching. Particularly effective for ornamental plants and for nursery stock, and has been shown to give improved yields of tomatoes. The thermic properties will help to maintain overnight temperatures. Note, however, that spring growth may be earlier under Lumitherm, Politherm or Luminal. Adds condensation control properties to Luminance THB. Use the latest polymer and additive technology to achieve good heat retention properties in a thinner, tougher film.